Telling it how it is in the world of waterfowling ballistics. Modern loads and choke designs continue to elevate waterfowlers' performace in the field. Some would say that it is like walking a narrow tightrope between two great mountains. In one hand, there is the mountain of professional responsibility, which dictates that I shoot, measure, and report the facts as they are. In the other, there is the other side of that rope that is attached to that second mountain that deals with all of those elements that we regard as ethical and responsible when taking up the craft of shooting waterfowl. My rope is stretched, and I stand someplace in the middle as I play this ethical and ballistic balancing act in spades. 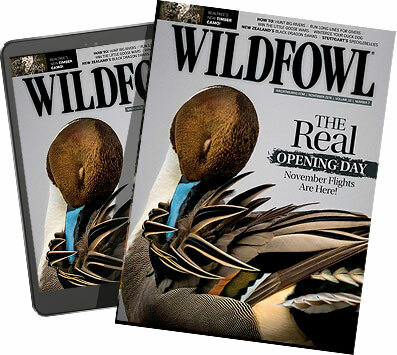 As long as I have been writing copy for Wildfowl (as well as other markets) there has been the cloud of the forbidden subject looming. That subject is dealing with any and all elements of extended range. In other words, skybusting. Move out beyond 40 yards and a significant part of the waterfowl fraternity goes ballistic. However, that move into other range applications is exactly what is required of a researcher and evaluator when it comes to finding the limits and ability of any give shot type, new load, or even different gun and choke designs. By killing the messenger (me! ), you're short changing yourself in the area of learned shotshell performance material. Now, add to all this mix the fact that just about everything being generated in the ammo companies' research and development departments is space-age based and retains the ability to fly hard and straight at ultra-long distances, you can start to see where I'm coming from. The world of high performance shotshells (as applied to waterfowl) has moved far beyond those old lead shot 40-yard standards we once used as the baseline measure. Now, nothing can remotely equate as a comparison between the loads of yesteryear and those of today. What is required here is a whole new standard in terms of a realistic application of workable range on targets. I didn't create this monster in range extension over the past decade; the hunter has by a sheer demand for more effective non-toxic ammunition. Because there has been this race within the industry for more energy and speed, everything has moved up a notch in terms of the increased performance scale, and with that you always have that additional byproduct labeled "range extension". Now, I would also like to add that after hunting about 50 years between the Arctic and the Southern Cross on far more than a single occasion, I'm more than a bit confused and suspicious when I hear waterfowlers lay down the strict edict that 40 yards (or darn near it) as a maximum range that should ever be regarded as workable in the field. The short form here is that if those hunters actually believe that line of thinking, they are in dire need of a range finder, or they just don't tell the truth. The fact is, I have seldom seen any party of duck hunters stay within that mythical 40-yard envelope. Therefore, with that fact in mind, it is always a basic need (at least to my way of thinking) to inform the hunter as to exactly what that load is doing ballistically at any given range, being 40 yards or beyond. The short form here is that I will continue to report the facts whether being shot at or not. What I won't do here is talk about shooting a tall bird out of the sky with a new super load. It seems as though I have gotten into enough trouble doing that lately. That slant on the subject is sure to bring more negative mail, so what I will do is tell you about a rancher-directed beaver reduction project of which I took part in during the late winter of 2006. Why the beaver control story in a waterfowl book, you ask? Because a mature beaver weighs in at 50 pounds soaking wet. These critters are tough as nails, with hunter and trapper reports of numerous shotshells or rifle rounds required to bring them down when in the water. Many times, only shots at point blank ranges are effective when dispatching them in their natural habitat. Here's an example of what we learned during our efforts to whittle down the big water rats in my home area of western South Dakota. We generally take on the big flat tails at about 11 p.m. for starters, and hunt most of the night as these guys are active in their tree cutting and water damming projects when the sun is in hiding. On this night, the Argo ATV, which is used on the wet river bottoms, was winding through pack ice and mud when the spotlight caught sight of a very large beaver moving along on the opposite river bank. The range was a solid 58 yards with the gunner (me) at a slight elevation, but with a shot only at a submerged set of vitals. The gun featured a short barrel tipped with a Hevi-Shot choke, and a scope sight with an integral spotlight and laser red dot that was zeroed dead-on to 50 yards. The red dot glowed bright on the pack ice in the river's center as it searched for the target by way of the shooter looking through the low magnification scope. With the target identified and locked on, I sent a stream of blinding fire a full yard out beyond the muzzle, which was followed by an uplifting of white water around the target. The big beaver raised up a few inches out of the water, then settled back down stone dead in the process. What had hit the critter was a new 3-inch load of Remington HD in a BB pellet size. This load, by way of my testing, has indicated no upper limit in terms of range extension, as it carries ample energy to ranges where all but a handful of shotgunners could ever compute lead, drop, and forward speed of an airborne target. The damage control hunters that were with me were completely amazed by what they had witnessed. All of them indicated that they hadn't expected to see that flat tail die at a single blast of that 12-bore short-pipe night-gunning system. When examining the beaver, as the pelt was prime and going to market, we found that a clustered pattern of nine pellets had hit the animal right behind the shoulder, and those pellets had entered the lung and heart area, thereby stopping the animal in its tracks. Now, the fact is that I was not shooting the biggest kid on the ballistic block as loaded by Remington in HD ammo. Currently, and still to be tested on heavy targets is the new T .20 caliber HD load. Where the ballistic envelope ends on this R&D brainstorm is anyone's guess. I am willing to bet that by the end of 2008, new fast and large shot loads will hit the waterfowl market. It's like a big poker tourney. Up the bid and go on playing the game.